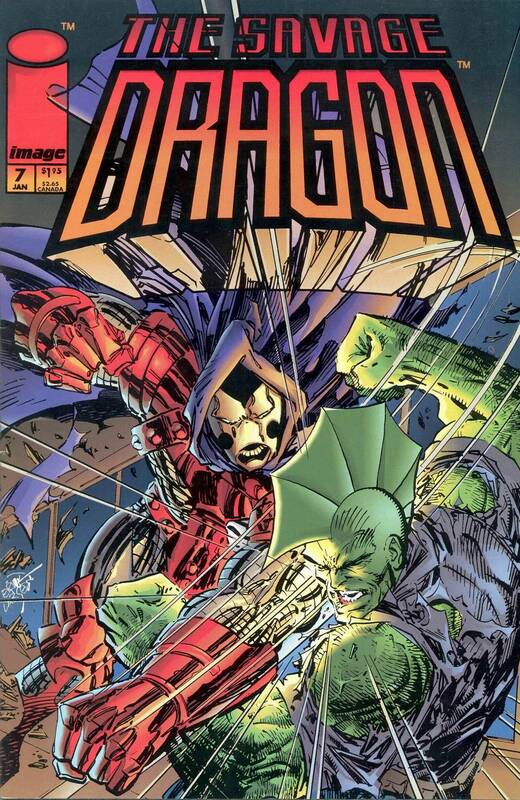 Dragon and Frank Darling take an elevator up through the skyscraper which serves at the headquarters to the arch-villain, OverLord. After making a deal with CyberFace, the Chicago Police Department have been able to secure a warrant for the criminal’s arrest. As they confront their quarry, Dragon demands that OverLord give himself up to them for apprehension. OverLord has no desire to act like a common criminal and be arrested. He claims that he has only allowed Dragon to live as long as he has because his actions amuse him. OverLord runs the city of Chicago and suggests that the two police officers leave or face his wrath. Dragon ignores this warning which prompts OverLord to open fire and incinerate an unsuspecting Frank Darling. This murder sets off Dragon into a rage and he attacks OverLord but underestimates just how formidable his nemesis is. He suffers a brutal beating but the death of Frank means that Dragon has no intention of giving up. Dragon steps up his efforts and declares that OverLord’s reign of terror is now over and Chicago will soon be free. CyberFace is discovered dead in his cell at the precinct of the Chicago Police Department by several officers. They realise that somehow the Vicious Circle has gotten to CyberFace and poisoned his food, leaving the incarcerated villain deceased.